This entry was posted in Writing and tagged Louis L'Amour, Mickey Spillane by James Scott Bell. Bookmark the permalink. Gone Girl’s ending horrified me. The thought of an innocent child being born to such despicable characters was distressing. Did it make me want to buy another Flynn book? No. 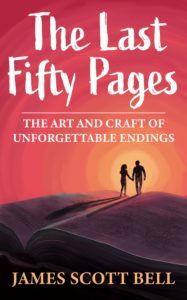 Pre-ordered The Last Fifty Pages and am eagerly awaiting delivery. Congratulations, Jim! Debbie, Gone Girl certainly qualifies as an “uh-oh” ending! Thanks for your support. I hope you enjoy the book. Oops, sorry for the spoiler. No worries! I welcome specific references. I updated and put a little “warning” about spoilers in the post. I ordered the book two weeks ago. I come to this blog to learn. I learn so much. You make this ordering too easy. But I’m excited to start reading. I’m in Bangkok and “tomorrow” starts in two hours. Should I wait up? If you do wait up, write at least 350 words! I am in the throes of writing my last chapter, so your blog post and book are both perfect timing. I always take away something when I read TKZ posts. Our pleasure here at TKZ, Julie. I’m about 75 pages to the end of my first draft. Thanks for the added pressure! (insert smiley face here) – which is another way of saying your book comes at precisely the right time. Ordering it now! Thanks as always for all you do here at Kill Zone. My Sunday wouldn’t be complete without you. A little pressure is a good thing, right Maggie? Happy to help! Escaped from the Faraday Cage that is most of my mother’s old house (visiting for her 93rd birthday) long enough to preorder. And thanks for making it available for my Nook. Much better user interface than the Kindle app. I’m only on chapter 1 of the new WIP, so I should have time to read and absorb. Should be a great supplement, refresher to your workshop at Colorado Gold. Hey, Terry, yeah, plenty of novel left to figure out the ending. Excellent! I have a story with an ending I’m not satisfied with. I think your book will be just the ticket to get it working. I hope so, Kessie. Let me know. I’m looking forward to reading the book. Thanks for putting it out in paperback. My wife’s first name is Cindy. She’s also my first reader. If the ending doesn’t resonate in the same key as the beginning and the theme, and with overtones (for those of you with a musical background), she sends it back to be rewritten. I’m looking forward to learning more about resonance. And that culinary technique of “stew, brew, accrue, and do” sounds like a tasty way to brainstorm. It’s quirky to be sure, Steve, but it works. Enjoy! I like the idea of your book a lot – will grab immediately. I find when I know where I’m going It gives me the greatest opportunity to create/choose the most interesting, exciting, and surprising path to get there. Coincidentally today on WU blog where you and Donald Maass occasionally appear there is an interesting post discussing the controversial ending of “In the Woods” written by Tana French. Solid post if have not read that book but fascinating for those that have. Will be reading “the last fifty” directly. Yes, exactly, Tom. And this doesn’t have to scare the pants off pantsers, because an ending is always subject to change without notice. But when you do have a North Star, you can drop in all sorts of great plot material. I often guess the “surprise” endings of movies. But I must admit that “The Sixth Sense” surprised and fooled me. And I loved it. Indeed, The Sixth Sense was one of the great twist endings. Yes, I remember. I haven’t trusted tall aliens since. I pre-ordered your new book as soon as I received your email the other week. Really looking forward to it. Perfect timing, my latest novel is now with my beta readers, and I know the ending needs work, perhaps lots of work! Speaking of endings, I really like the emotional resonance in the endings of Tana French’s novels–especially The Faithful Place, when Frank learns why his teenaged love ditched him and what really happened to her. The emotional gut punch of that ending still lingers years later. Really looking forward to Endings! Dale, that “gut punch” type of ending is so satisfying to pull off. I have several suggestions in the book to help make that happen. And for me, definitely, the ending is where I put in the most work! Although much maligned by critics, I loved “The Girl with the Dragon Tattoo”. I was so involved in Michael and Salander’s relationship and the plot puzzle that I didn’t see the ending coming. Best of the series in my opinion. I liked it, too, and also the Swedish movie version. Such great timing! I just ordered the book to add to my JSB library. I’m working on my second mystery novel now. The twisty climax in my first novel really pleased me — mainly because it surprised ME when I was writing it. Now I’d like to come up with another good one for the current work. Sounds like your book can get me there. I think you’ll like what you find, Kay. May you be happily surprised…again! Louis L’Amour’s Last of the Breed is a great escape and evasion thriller. I read it a few weeks ago. Can’t wait to read your new book. He was a great entertainer, for sure, RG. Pre-ordered. Mr. Bell has his own folder on my Kindle. Looking forward to adding this one! My own folder? Now that’s nice. Thanks, Carl! Thanks for the nod, Brother Bell. I just ordered the book–the expensive paper version! And I will sign it over a couple of chilled Gilstraps. Enjoy! Hope so, Sue. Happy writing! Right on, Kris. Somewhere I read (probably Dwight Swain) that an ending must be surprising but, in retrospect, seem “inevitable.” Not easy! But man, when it’s carried off, it’s a difference maker. What an excellent column. Too many otherwise well-written books seem to collapse under the weight of a poor ending. Sometimes I wonder whether the ending was an editorial decision by committee, not the one the author had in mind. Just leaving off the final chapter entirely would have improved matters in some cases. Delivering a poor, weak, trite, or other ending that makes the reader say “Huh?” is a violation of the contract the author made with the reader on page one. Resonance seems to be the most important factor in good (satisfying) endings. Thanks for all your great advice. Thanks for the kind words, Michaele! Yes, the ending is the hardest, hardest part. I sweat more over the final chapters than anything else. I am drafting out a new story, and your advice to get the ending going up front is timely. Thank you! I preordered your book last week and voila, it appeared on my Kindle carousel last night. Hooray! Hooray right back at you, Laura. Enjoy! I pre-ordered your book and started reading first thing this morning. It came at the perfect time. I’ve been working on my current WIP for quite some time (compared to my 3 previous books anyway) and I’m at the jumping off point as far as the climax and ending goes. I’ve always had a vague idea of the where and what, of it, but nothing concrete. I wasn’t even sure how or even if I was going to get there (probably why it’s taking me so long.) But now, your book has given me all kinds of avenues and ideas on how to flesh that out. So THANK YOU! That is GREAT to hear, Nancy! Hi James. Got your book on pre-order – looking forward to diving in. I’ve followed the North Star by writing my novel from the end – well it started as an idea, became a short story then the What If? happened. I’ve been playing with it for several years, written in scenes mostly, and learned much along the way – most recently an Immersion Masterclass here in Australia with Margie Lawson in November. Pleased to say the end is truly, finally, near (and has barely changed). Thanks for all that you share here, and for your writing books. I have them all! Kind words, Jay. Thanks. Now finish that book!